Last October in general conference I called for more missionaries. Every worthy, able young man should prepare to serve a mission. Such service is a priesthood duty﻿—an obligation the Lord expects of us who have been given so very much. Young men, I admonish you to prepare for service as a missionary. Keep yourselves clean and pure and worthy to represent the Lord. Maintain your health and strength. Study the scriptures. Where such is available, participate in seminary and institute. Familiarize yourself with the missionary handbook Preach My Gospel. Sisters, while you do not have the same priesthood responsibility as do the young men to serve as full-time missionaries, you also make a valuable contribution as missionaries, and we welcome your service. To the mature brothers and sisters of the Church, I remind you that the Lord needs many, many more of you to serve as full-time missionaries. If you are not yet at the season of life to serve a couples mission, I urge you to prepare now for the day when, as your circumstances allow, you and your spouse might do so. There are few times in your lives when you will enjoy the sweet spirit and satisfaction that come from giving full-time service together in the work of the Master. Now, some of you may be shy by nature or consider yourselves inadequate to respond affirmatively to the call to serve. Remember that this is the Lord’s work, and when we are on the Lord’s errand, we are entitled to the Lord’s help. The Lord will shape the back to bear the burden placed upon it. Others, though worthy to serve, may feel they have more important priorities. Well do I remember the Lord’s promise: “For them that honour me I will honour” (1 Samuel 2:30). None of us will honor our Heavenly Father and our Savior more than by serving as a devoted, compassionate missionary. An example of such service was the missionary experience of Juliusz and Dorothy Fussek, who were called to fill a mission in Poland. Brother Fussek was born in Poland. He spoke the language. He loved the people. Sister Fussek was born in England and knew little of Poland and nothing of its people. Trusting in the Lord, they embarked on their assignment. The work was lonely, their task immense. A mission had not at that time been established in Poland. The assignment given the Fusseks was to prepare the way so that a mission could be established. Did Elder and Sister Fussek despair because of the enormity of their assignment? Not for a moment. They knew their calling was from God. They prayed for His divine help, and they devoted themselves wholeheartedly to their work. “My help cometh from the Lord, which made heaven and earth. “… He that keepeth thee will not slumber. “Behold, he that keepeth Israel shall neither slumber nor sleep” (Psalm 121:2–4). Teaching, No Greater Call states: “Share a personal experience about how living a gospel principle has blessed your life. Invite those you teach to briefly share their own experiences” (, 159). 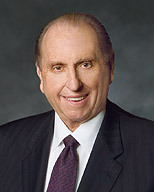 Read this message and then ask family members whom President Monson has said should serve a mission. Share personal experiences that you or others have had serving as full-time missionaries. Or share your plans to serve as a missionary in the future. Ask family members to share their plans and positive experiences.